I love our 7th UU Principle. But, it’s not just because I’m a lover of nature and an advocate for environmental justice. Our children love our 7th Principle. In my 8 years of experience as your DRE, the 7th Principle is the one they got most excited about. It’s the one that resonated most deeply with them. But, it’s not just because children love animals and nature walks. I remember a poster we had that explained our 7 Principles in “kid language”. The 7th Principle said “We care for Earth’s lifeboat”. Sure. That’s a vital concept and call to action. But it’s a serious oversimplification of that principle and it deprives our kids of a theological connection to Unitarian Universalism. You see, the 7th UU Principle is different from the rest. Go ahead, read them all. Look them up online or grab a gray hymnal and find them in the front. First, notice that none of them are meant to be statements of belief, but rather of action. They are guiding principles by which we are called to live and embody in our everyday actions so as to shape the world with love and justice. Then, notice and reflect upon how the 7th Principle embraces the first six, wraps them up in a theological context, and calls us to moral action by means of the spirit. The 7th Principle is an intersection at which we find a call to action and a Unitarian Universalist theology. The 7th Principle reminds us that even though we are all independent, unique, and worthy individuals, we do not stand alone, we are not above the web of life, more special than the rest of creation, and every action we take, every word we say, matters to all the rest of existence. We are an equal part of it- connected to each other, to the animals, the plants, the rocks, the soil, the air, the water, the fire. We are all one. God is one. There is one love. During this month of April, we will dive into this 7th Principle and explore the treasures that await us in the deepest parts of its theological waters. I’m especially excited that this month also brings about the Christian Holy Week and we can discover theological concepts behind Palm Sunday and Easter that perhaps we haven’t encountered before. 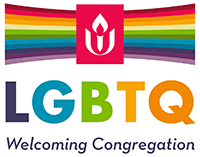 This, combined with our UU Flower Communion, will help us strengthen our connections to ourselves and with each other. And ultimately, it can inspire us to action so that we can better articulate the good news of Unitarian Universalism to others and to help heal our world. I love our 7th Principle because it stirs the Spirit of Life in my heart and soul. Its deep theology is the driving force behind all that I am called to do in this world. It is the inspiration for the love that I have for all of you. It enables me to come alive with a smile when I see you. It inspires my enthusiasm and helps me to gather the energy we need to do our life-saving, web-of-existence-loving work together. Namaste.